Any science textbook will tell you we can't see infrared light. 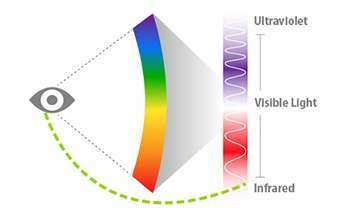 Like X-rays and radio waves, infrared light waves are outside the visual spectrum. But an international team of researchers co-led by scientists at Washington University School of Medicine in St. Louis has found that under certain conditions, the retina can sense infrared light after all. 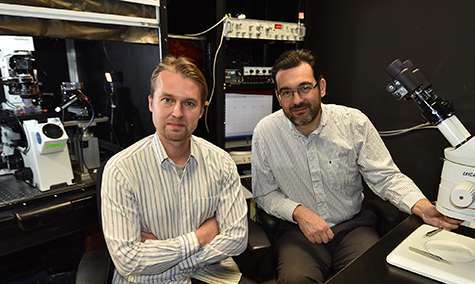 Using cells from the retinas of mice and people, and powerful lasers that emit pulses of infrared light, the researchers found that when laser light pulses rapidly, light-sensing cells in the retina sometimes get a double hit of infrared energy. When that happens, the eye is able to detect light that falls outside the visible spectrum. "We're using what we learned in these experiments to try to develop a new tool that would allow physicians to not only examine the eye but also to stimulate specific parts of the retina to determine whether it's functioning properly," said senior investigator Vladimir J. Kefalov, PhD, associate professor of ophthalmology and visual sciences at Washington University. "We hope that ultimately this discovery will have some very practical applications." The research was initiated after scientists on the research team reported seeing occasional flashes of green light while working with an infrared laser. Unlike the laser pointers used in lecture halls or as toys, the powerful infrared laser the scientists worked with emits light waves thought to be invisible to the human eye. "They were able to see the laser light, which was outside of the normal visible range, and we really wanted to figure out how they were able to sense light that was supposed to be invisible," said Frans Vinberg, PhD, one of the study's lead authors and a postdoctoral research associate in the Department of Ophthalmology and Visual Sciences at Washington University. Vinberg, Kefalov and their colleagues examined the scientific literature and revisited reports of people seeing infrared light. They repeated previous experiments in which infrared light had been seen, and they analyzed such light from several lasers to see what they could learn about how and why it sometimes is visible. "We experimented with laser pulses of different durations that delivered the same total number of photons, and we found that the shorter the pulse, the more likely it was a person could see it," Vinberg explained. "Although the length of time between pulses was so short that it couldn't be noticed by the naked eye, the existence of those pulses was very important in allowing people to see this invisible light." Normally, a particle of light, called a photon, is absorbed by the retina, which then creates a molecule called a photopigment, which begins the process of converting light into vision. In standard vision, each of a large number of photopigments absorbs a single photon. But packing a lot of photons in a short pulse of the rapidly pulsing laser light makes it possible for two photons to be absorbed at one time by a single photopigment, and the combined energy of the two light particles is enough to activate the pigment and allow the eye to see what normally is invisible. "The visible spectrum includes waves of light that are 400-720 nanometers long," explained Kefalov, an associate professor of ophthalmology and visual sciences. "But if a pigment molecule in the retina is hit in rapid succession by a pair of photons that are 1,000 nanometers long, those light particles will deliver the same amount of energy as a single hit from a 500-nanometer photon, which is well within the visible spectrum. That's how we are able to see it." Although the researchers are the first to report that the eye can sense light through this mechanism, the idea of using less powerful laser light to make things visible isn't new. The two-photon microscope, for example, uses lasers to detect fluorescent molecules deep in tissues. And the researchers said they already are working on ways to use the two-photon approach in a new type of ophthalmoscope, which is a tool that allows physicians to examine the inside of the eye. The idea is that by shining a pulsing, infrared laser into the eye, doctors might be able to stimulate parts of the retina to learn more about its structure and function in healthy eyes and in people with retinal diseases such as macular degeneration. My eyes certainly detect a part of (unstimulated) photons over 720nm, most likely up to 850~920nm.. Finally some words of wisdom in this thread. Thank you ogg_ogg. First, laser physicists will know that the eye has a little bit of direct sensitivity to very short IR. The pump diodes for 1micron YAG lasers operate at 808nm, although the power has to be dangerously high. The light appears light pink. As for the result specific to this article, it's not surprising in the least. The process that they never name is called two photon absorption. I'm really surprised that this result wasn't expected. It is actually sight, at least up to somewhat 800nm.. that is about the point vision changes from color (red) to more grayish very low frequency per nm, from that individual point we may refer to something else than sight, but in the end, the simple detection of photons following up a visual makeup in your brain "lighting up" the environment .. how would you call it? the race is on to test millions of people for establishing the 3 standard deviations of sensitivity. once this is accomplished, outliers of extreme infrared sensitivity of opposite sexes will be matched, and paid large sums to have children, who will be bred with children of similar extreme sentitivity. Yes! Finally! Someone has common sense here! Although i would look for people who can see infrared AND hear ultrasound (or near it). So the race is on to create night-vision-bat-people! Sight is the stimulation of photorecetptors to get a visual impression. That is exactly what is happening here (green dots). How is that not sight? Double-photon absorbance exists for all physical systems and not just the ones already well studied in laser physics and optical fluorescence? The point here is that this can possibly be used for low power, direct retinal display. Consider the "after image" effect: Stare at a bright red pattern on a black ground then look away. There will be an after image in green, the complement of red. At one time I had two red lamps over my dining table. A few meters away an ornament cast a shadow from each lamp on a white wall. The shadows appeared green. Lastly, a mix of red and green lamps, or pixels on your screen, produces yellow. And artists know about adjacent complements. In painting, if you have a pure black adjacent to a green object and the same black against a red object, the black in each case takes on some small amount of the complement. You can intensify the apparent blackness of an object in the scene with a small amount of the nearby color mixed into the black. These are tricks of the eye, nothing to do with two photon absorption. I am suggesting to look more to the physiology of the eye than at the physics of light for the answer to this puzzle. Visible 500 nm light is just the second harmonic of invisible 1000 nm infrared light. It is quite normal for a transmitter designed to produce radio waves at 1000 m (300 Khz) to also produce harmonic emissions at 500 m (150 KHz), as well as 250 m (75 Khz) and so on. The harmonics signals are much weaker than the primary wavelength, but can be a serious problem unless one takes steps to suppress them. This is why the US Amateur Radio stations were originally assigned the 160m, 80m, 40m, 20m, 10m and 5m bands, so the harmonic interference from their "crude and unprofessional" transmitters would only affect their bands. We can predict that there can be some visible light as a byproduct of producing the "invisible" IR. We do not need double-photon capture in the eyes of the subjects, but just normal harmonic production in the source. Before we seek exotic explanations for these observations, we should insure that our source is not releasing any visible light. If we look at FFT of pulsed waveforms, we can notice that they contain harmonics. So these researchers should use filters to exclude any visible photons, before they can determine that this is purely double photon absorbtion. And not just detection of the harmonic content. Intensity only lowers the probability of a double absorption. It is not a threshold value. Lowering the intensity of laser light does not change the energy of the individual photons. That is always the same. It just decreases the number of photons. Assuming this is an accurate observation, what is the likelihood that human vision could be extended into the UV spectrum as well?